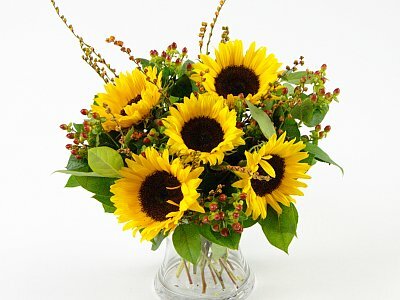 Sunflowers brighten up your garden and home with a ray of sunshine and are one of our most loved types of flowers. They provide food for bees, squirrels and birds who eat their seeds and are one of the fastest growing plants in the world, growing 8 to 12 feet tall within six months. The scientific name for these plants is 'Helianthus', with Helia meaning the sun, and Anthus meaning flower. They were originally grown in North America and were eaten by Native Americans. During the Autumn when the sunflower heads start to loose their petals, the seeds ripen and dry up. One sunflower is capable of producing up to 2000 seeds through the year. There are two types of sunflower seeds - black seeds and striped seeds. The black seeds are used to make sunflower oil, and the striped seeds are used as snacks or to feed birds and other small animals. Our Sunflower Surprise is a beautiful collection of rich sunflowers, carefully arranged by our team of florists. This bouquet adds that warm, summer feeling to your home, and is a beautiful table piece. Growing Sunflowers is easy and you can even plant seeds that you bought in your local supermarket provided they are still in their shell. To grow the large, taller sunflowers we recommend you purchase the seeds that have been saved especially for planting. Sunflowers need plenty of water when growing, and it takes roughly two weeks until the first sprout shows.